Last week, Libby Schaaf, mayor of Oakland, took the logic of so-called sanctuary cities and states one step further by warning that Immigration and Customs Enforcement had planned a raid on immigrants in the country illegally. Over the weekend, roughly 150 immigrants were apprehended in Northern California. Predictably, the backlash from Trump supporters, immigrant haters and ICE authorities has been intense. Was Schaaf impeding law enforcement? What was she thinking? It was probably a good deal like what the leaders of pre-Civil War Northern cities and states were thinking when they resisted the federal government's efforts to enforce the Fugitive Slave Act, which a Southern-dominated Congress had enacted in 1850. In case you don't remember your U.S. history: An 1842 court ruling absolved states of any duty to cooperate in the recapture of former slaves who'd freed themselves by fleeing to the North. In response, as part of the Compromise of 1850, the Congress passed and President Millard Fillmore signed the Fugitive Slave Act, which not only required state and local governmental officials to aid owners and their agents who'd come North to capture and re-enslave the runaways, but also required the same level of cooperation from all citizens. If a slaver was in the act of recapture, bystanders were required to help out. Not surprisingly, the North greeted the new law with fury and resistance. Vermont, Maine, Connecticut, Massachusetts, Rhode Island, Michigan and Wisconsin all enacted "personal liberty laws" — the 1850s equivalent of California's sanctuary state law — forbidding public officials from cooperating with the slave owners or the federal forces sent to back them up, denying the use of their jails to house the captives, and requiring jury trials to decide if the owners could make off with their abductees. The Wisconsin Supreme Court ruled that the Fugitive Slave Act violated the Constitution's 10th Amendment, which gave states the power to enact laws not specifically preempted by federal authority. (The Southern-dominated U.S. Supreme Court overturned that ruling on the eve of the Civil War). Opponents of the Fugitive Slave Act also took to the streets (and jury rooms, where verdicts were rendered that freed some of the captives). Crowds would form to oppose and resist, sometimes forcibly, the apprehensions of African Americans. According to H. Robert Baker, a historian at Georgia State University, "Whole sections of Milwaukee, Chicago, New York City and Boston became no-go zones for slave catchers." Confronted with this level of resistance, Fillmore sent in federal troops to assist and protect the slave catchers. History doesn't repeat itself, but in our dispute over immigrants in the country illegally and our predecessors' dispute over fugitive slaves, it takes no leap of logic or imagination to find the rhymes. Now, as then, one part of the country (President Trump's disproportionately rural, white nationalist base) has enlisted federal power to enforce a legal regime in a different part of the country (racially diverse, immigrant-heavy cities) that views the law as morally repulsive and destructive of the social fabric. Just as the slave catchers argued, speciously, that freed Negroes imperiled the antebellum North, today's anti-immigrant forces, beginning with Trump, argue that immigrants pose a threat to public safety, though crime has fallen precipitously during the past quarter-century. The only "crime" that most undocumented immigrants have committed — and the only one that places them in federal legal jeopardy — is that of being undocumented. Likewise, the only "crime" that most escaped slaves had committed — and the only one that placed them in federal legal jeopardy — was escaping. And in yet another rhyme, cities and states are fighting back. Police are enjoined from cooperating with ICE. 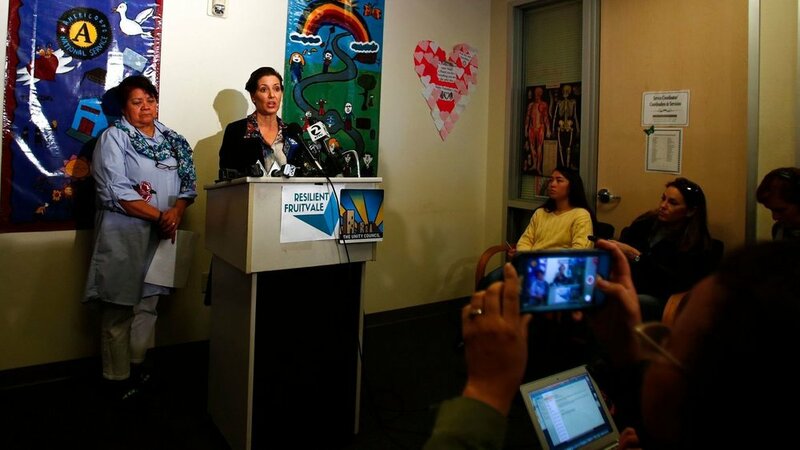 Citizens groups have formed rapid response teams to support apprehended immigrants and, when they have reason to believe raids are imminent, send out a warning — as Schaaf did last week. But there's still more that our citizen bystanders can do, including peaceful, obstructive civil disobedient sit-ins at ICE offices. The right kind of confrontation may even give some ICE agents second thoughts about their mission. After all, if the Trump roundup persists, they're likely to join the troops who enforced the Fugitive Slave Act in history's moral dustbin.